b) Supervision and control the entire Postal Ballot process ,authorise a Managing or Whole-time Director and the Company Secretary or where there is no such anaging or Whole-time Director, any other Director and the Company Secretary. c) Appointment of one scrutinizer, who is not in employment of the company and who, in the opinion of the board, can conduct the postal ballot voting process in a fair and transparent manner and fixing the duration of his appointment as well as his remuneration, or authorising the Chairman/Managing Director or a Whole-time Director or any other director to fix his remuneration. f) The date of end of voting. 6. The notice shall be sent either (a) by Registered Post or speed post, or (b) through electronic means like registered e-mail id or (c) through courier service for facilitating the communication of the assent or dissent of the shareholder to the resolution within the said period of thirty days. 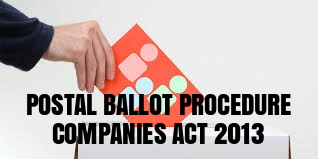 10.If a resolution is assented to by the requisite majority of the shareholders by means of postal ballot including voting by electronic means, it shall be deemed to have been duly passed at a general meeting convened in that behalf. i) postal ballot forms which are invalid.